The City of Beech Grove announced a town hall meeting will be held on Wednesday, November 16, 2016 - 7:00pm at Hornet Park Community Center located at 5245 Hornet Avenue. Topics to be discussed includes, city projects, OCRA Main Street designation and an update on St. Francis Hospital property. The public is welcome and encouraged to attend. A meeting for Beech Grove residents was held on, Wednesday, October 26th,2016, at Hornet Park Community Center. 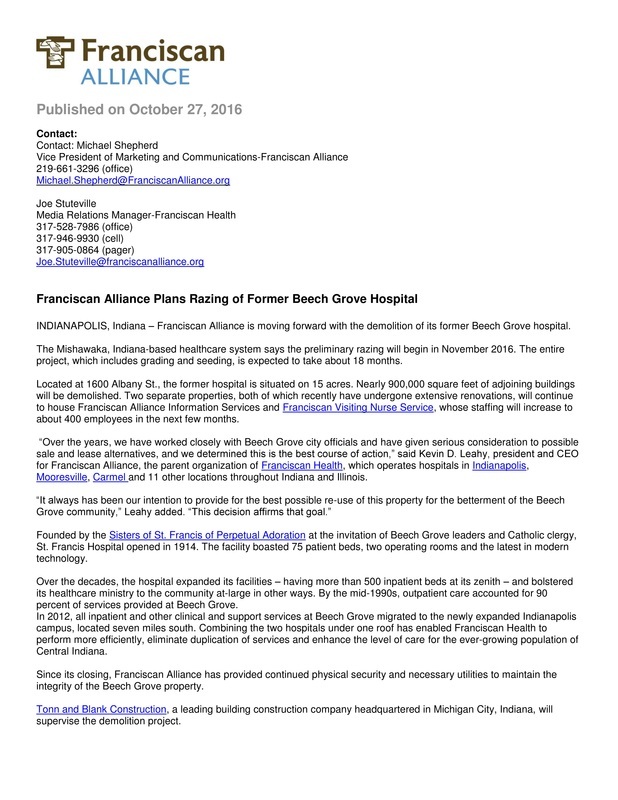 Information was shared regarding the plans for the demolition of the the previous St. Francis Hospital. Further details can be found in the press release below. Tonn & Blank, as well as city officials were present for the meeting. Beech Grove, IN - The Beech Grove Parks and Recreation Board is seeking public comment on the 2016-2020 Parks, Recreation and Open Space Master Plan. Public input has been a very important consideration in developing the plan, which will serve as a guideline for the Beech Grove Parks system over the next five years. The public comment period will be Monday, March 21, through Friday, April 8, 2016. The plan and online comment submission form are available on the City’s website, http://www.beechgrove.com/2016-2020-parks-recreation-and-open-space-master-plan.html. Hard copies are available upon request. A final public meeting for the plan will be held on Tuesday, April 5, 2016. The plan will be on the agenda for adoption by the Beech Grove Board of Parks and Recreation at their regular meeting on Wednesday, April 13, 2016. Both meetings will be held at 7:00pm at the Hornet Park Community Center. · Consider turning up the volume on cell phone notifications. Be familiar with the notification settings of weather apps. · Have an all-hazards (weather) radio near the bed or sleeping area. Keep the weather radio turned on at a volume loud enough that alerts can be heard while sleeping. Overnight alerts could provide important details about severe weather, with safety precautions to follow. · If devices such as phones and laptops are charging overnight, be sure they are plugged into a surge protector.